Pioneer has a respectable name when it comes to CD/DVD Optical drives. Their two previous DVD Burners, the A04 and A05 were highly acclaimed and paved the way in the new technology of DVD burning. Today I will be reviewing the Pioneer DVR-A06 DVD Burner. While there is no speed difference between the A06 and A05 (both are 4X), but the A06 is the first Pioneer drive to offer dual burning formats (DVD+R and DVD-R). The DVR-A06 comes packaged in a vibrantly colored orange box. Upon opening the box, it revealed the drives true colors: a bland grey. The DVR-A06 looks like every other DVD Burner out there, plastering their name and supported formats all over the bay of the drive. Among the normal Eject Button, activity LED and manual eject hole runs two horizontal ventilation slits. These slits should not be covered or else you will run the risk of the drive over-heating. Two things that I've grown accustomed to that are missing on the DVR-A06 is the headphone jack and drive's volume control. The DVR-A06 being a drive ahead of its time supports six different types of disc storage formats; all which burn at different speeds. Yadda yadda, check the specifications image below. Using Nero's CD/DVD Speed Utility, we tested the following media on the DVR-A06. 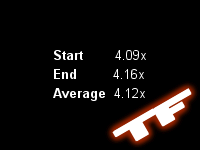 Max speed 2x, the advertised speed is 2.4x but since the DVD-RW was only 2x, this is the highest it was able to reach. 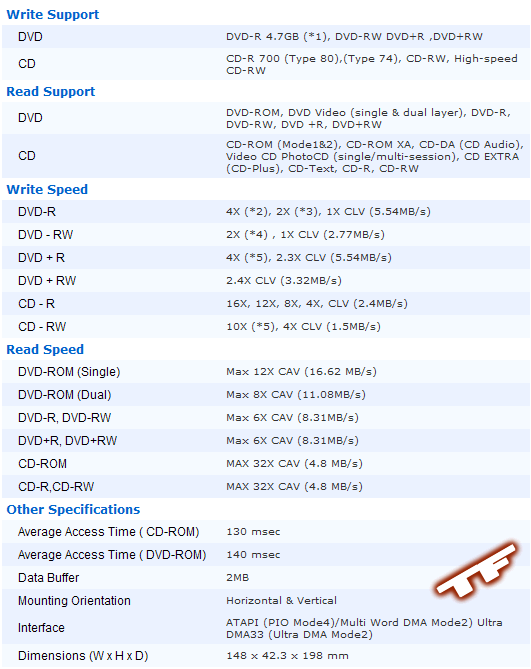 Max speed 2.45x on a 4x DVD+RW. This is the drive's limitation, a small downside. I thought the Pioneer DVR-A06's overall performance was exceptionally good for a recently released DVD burner. I didn't like the fact I couldn't burn at some of the DVD's top speeds because of drive limitations, but it still does the job. Another problem I noticed is the fact that if I use the computer while burning, it could freeze and crash the burning process, therefore turning your DVD into a coaster. I'm not sure if this is a problem with my computer, or all of them, but it is recommended to not touch anything while it is burning, or have anything running that could interrupt the burning process. Instant Messaging programs come to mind. Pioneer has once again brought another great quality drive to the market. The DVR-A06 is not for everyone though; film makers or people who just want to backup information only need a drive that supports might favor a less expensive and less feature-full drive. For those who like to experiment or have certain equipment that supports one type of DVD format over the other (DVD Players especially), then this is the drive for them. All in all, this drive does what it is advertised to do, even though 8x drives are on market, this is a cheap alternative to try as it is only 4x slower, and most patient people can handle it. I recommend this drive to anyone interested in dual-format burning, otherwise go with a cheaper single-format alternative.